Buddy, one of Martha’s rescue cats. He needed an operation for a cleft palate – a gap in the roof of his mouth. He is a great cat. Dead feral cat. Richard was feeding a feral cat colony and saw her. He took her away in case she might poison the other cats. Very sad. 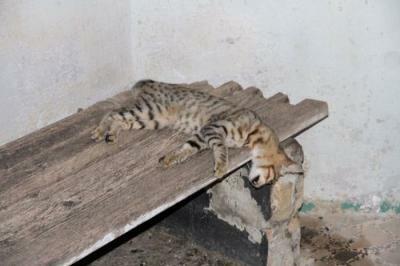 Feral cats who are part of a colony occupying an abandoned villa. They are feeding at dawn after Richard put down dried food. 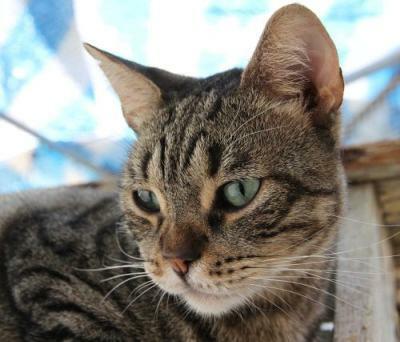 8th October 2010 – Sliema, Malta: Some visitors might have seen the earlier posts about Martha’s heroic efforts to rescue cats in Malta. My favourite, though, is the story about her educating the children. That was an awesome event that I hope will save many cats from being abandoned or mistreated in the long term. It was the best kind of proactive cat care! Please note: the photos on this page are thumbnails – please click on them for larger versions. There are many beautiful cats in the world. For me, the most beautiful are the most vulnerable, the ones who are most in need of our love and care. There is an inexhaustible supply of these beautiful cats. Take Milo for instance. He was rescued by Martha after being tortured by people (they weren’t found). When he was picked up his right eye was out of its socket and sticks or something had been stuck into him – grizzly and ghastly but not untypical for a case of cat cruelty. Milo has found his forever home and he is well loved. He is a large lovable boy and probably the alpha cat of the group he is lives with. You might have had the chance to see some other of Martha’s cats on this page: Martha’s cats. While I was photographing Martha’s cats upstairs on the roof, Martha pointed out a cat on her neighbour’s roof. Her neighbour’s roof is open on all sides with a large drop. The cat is totally blind. Another case of irresponsible human behavior – sorry. Martha fed her neighbour’s cats because they were so skinny! If there is a cat or animal that requires help, Martha will respond to it, wherever and whatever it is. I have also mentioned Martha’s partner, Richard in the first post on Martha’s rescue operation. He is an extremely practical person who works fast and efficiently. He has to. He works full-time as well! In the picture below you can see him with concerned people, discussing the trapping of a feral kitten who was stuck on the fourth floor of a block of flats in construction. The people live opposite the construction site. A feral cat colony also lives around the building and Richard feeds these cats in preparation for trap, neuter, return. One of the feral cats is seen cautiously ambling by. This picture was taken at night, when the cats are about. I have mentioned that Richard manages several feral cat colonies. One is conveniently close to his work place. The site is an abandoned villa with a nice overgrown garden – perfect for feral cats and with Richard nearby, it doesn’t get better for a feral cat! Here is a picture of one of them. He looks typically feral. He looks at me with great caution and concern; ready to fly off if he has to. The photograph was taken at about 6 in the morning so there was barely enough light to get this shot. I hope these photographs give a feel for the Martha Kane’s Kitty Appeal operation. All these cats are fed by Kitty Appeal. There are 8 feral cat colonies maintained and managed by Kitty Appeal. There are about 200 cats in all that are fed by her rescue operation. That translates into sacks and sacks of cat food! Then there are vet’s bills and….. This is expensive work and Richard and Martha use a good percentage of their own money to fund Kitty Appeal. I hope some visitors can find it in their heart to give a little to Martha Kane’s Kitty Appeal rescue organization. If you can, simply visit her site and click on the PayPal button – thanks. Martha also has a Facebook page (new window) – please visit it for updates from her. Martha and Richard do wonderful work and it just shows the difference between those lovely compassionate people and the ones who don’t care about any animal or any person apart from themselves. Yes, I saw that frightened little face. There were quite a large number at this villa. At the time Richard was feeding the cats. It was about 6 am, semi-dark. As soon as Richard drives up the cats come out from the shadows and patiently wait for the food. It was really nice to follow Richard around this part of Malta (Sliema area) feeding and managing his feral cat colonies. I am going to do a short video as well which I will add to one of the pages so you’ll hear Martha and get a feel for what it is like. Milo is a very beautiful boy, and whoever took his eye out in such a cruel manner ought to have the exact thing done to them. No one has the right to treat any animal with such disgusting cruelty! In the photo of the feral orange spotted tabby, who is a beautiful cat, by the way, did you notice the kitten in the background? It’s sad that there’s so many ferals. 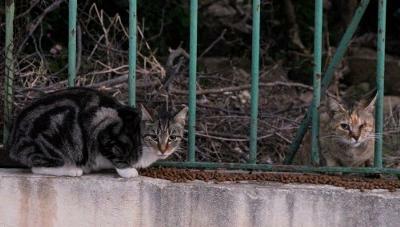 Hopefully Richard’s trap, neuter, return plan will contribute to the downsize of Malta’s feral cats.